I used Hobby Clay to make the cobblestone path way. I then used a knife to indent to patter on the pathway, making sure it was random patterns. I then used screw up silver foil and a rolling pin to roll over the top to make the stone cobbles more realistic. I then took the scenery back off and sprayed the whole board black. 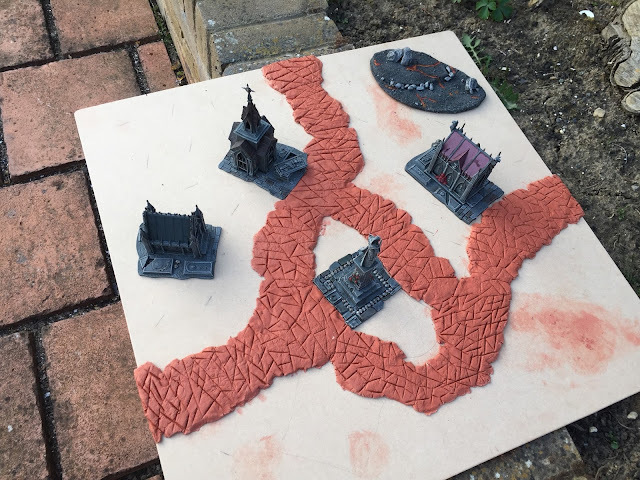 Followed by a spray of Mechanicus Standard Grey one the pathway. I sprayed random parts Green for where I wanted the crackle paint to be, this will give a glow effect underneath. I washed the pathway with Agrax, Nuln Oil and Reikland and drybrushed back up with Dawnstone and Terminatus Stone. I then added the gravestone where I wanted them. I applied the homemade stir land mud (polyfiller, sand and brown acrylic paint) and the crackle paint and left for a few hours to dry in the sun. And finally added the flock, shrubs and meadow flowers. All of the scenery is removable for easier storage, but thats it. Took roughly 6 hours (excluding waiting time). But really happy with how it turned out!